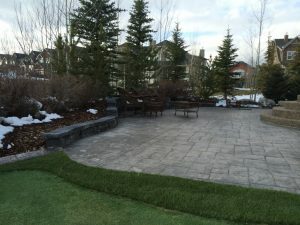 Retaining walls and concrete patio landscape project - Curb Design Inc.
One of our recent landscape projects done in spring. Beautiful retaining walls and a custom concrete patio. Large trees and shrubs located in the far back of the landscape. Patio furniture located center stage on top of the concrete patio.